In case anybody's been wondering where I've been since Christmas--I've been running around like a chicken with my head cut off (whatever that means). I had to finish and frame 14 pieces for a small show in Chesapeake, Virginia, which was to run in conjunction with a 3 day workshop I was to teach January 18. But before that workshop, I had to teach another 5 day class in Chattanooga. So I've been in and out of town and am only now able to get back into my studio to do my small pastels--which I've missed doing. They're very relaxing to do, and some of them inspire larger works. Anyway, I'm back, and so are my small pastels. 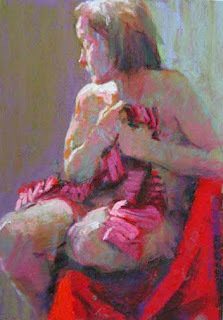 This pastel is of Annette with a striped towel. Annette was one of the models for the Chattanooga class (Hello Mimi, Cynthia, Cyn, and Annette, if you're seeing this). More Chattanooga and Chesapeake poses will be showing up the next few days. And then I'll tell you about Blackwater Workshops in Chesapeake. AN UPDATE ON OUR COOKBOOK. click to see more.